findfeatures was developed to provide an alternative approach to create image-based ISIS control point networks. Traditional ISIS control networks are typically created using equally spaced grids and area-based image matching (ABM) techniques. Control points are at the center of these grids and they are not necessarily associated with any particular feature or interest point. findfeatures applies feature-based matching (FBM) algorihms using the full suite of OpenCV detection and descriptor extraction algorithms and descriptor matchers. The points detected by these algorithms are associated with special surface features identified by the type of detector algorithm designed to identify certain charcteristics. Feature based matching has a twenty year history in computer vision and continues to benefit from improvements and advancements to make development of applications like this possible. This application offers alternatives to traditional image matching options such as autoseed, seedgrid and coreg. Applications like coreg and pointreg are area-based matching, findfeatures utilizes feature-based matching techniques. The OpenCV feature matching framework is used extensively in this application to implement the concepts contained in a robust feature matching algorithm applied to overlapping single pairs or multiple overlapping image sets. findfeatures uses OpenCV 3.1's FBM algorithms to match a single image, or set of images, called the trainer image(s) to a different image, called the query image. Feature based algorithms are comprised of three basic processes: detection of features (or keypoints), extraction of feature descriptors and finally matching of feature descriptors from two image sources. To improve the quality of matches, findfeatures applies a fourth process, robust outlier detection. Feature detection is the search for features of interest (or key points) in an image. The ultimate goal is to find features that can also be found in another image of the same subject or location. Feature detection algorithms are often refered to as detectors. Detectors describe key points based on their location in a specific image. Feature descriptors allow features found by a detector to be described outside of the context of that image. For example, features could be described by their roundness or how much they contrast the surrounding area. Feature descriptors provide a way to compare key points from different images. Algorithms that extract feature descriptors from keypoints in an image are called extractors. The third process is to match key points from different images based on their feature descriptors. The trainer images can be matched to the query image (called a trainer to query match) or the query image can be matched to the trainer images (called a query to trainer match). findfeatures performs both a trainer to query match and a query to trainer match. Algorithms for matching feature descriptors are called matchers. The final step is to remove outlier matches. This helps improve the quality and accuracy of matches when conditions make matching challenging. findfeatures uses a four step outlier removal process. At each step, matches are rejected and only the surviving matches are used in the following step. A ratio test comparing the best and second best match for each point removes points that not sufficiently distinct. The matches are checked for symmetry. If a match was made in the trainer to query match, but not in the query to trainer match (or vice versa) then the match is removed. The fundamental matrices between the trainer images and the query image are computed using the RANSAC algorithm and matches that exceed the RANSAC tolerance are removed. The homography matrices (projections from one image's perspective into anothers) from the query image to the trainer images are computed using the RANSAC algorithm and matches with a high residual are removed. Matches that survive the outlier rejection process are converted into an output control network. From here, multiple control networks created by systematic use of findfeatures can be combined into one regional or global control network with cnetcombinept. This can result in extremely large control networks. cnetthinner can be used to reduce the size of the network while maintaining sufficient distribution for use with the jigsaw application. If the control network is going to be used to create a DEM, then it should not be thinned. findfeatures is designed to support many different image formats. However, ISIS cubes with camera models provide the greatest flexibility when using this feature matcher. ISIS cubes with geometry can be effectively and efficiently matched by applying fast geometric transforms that project all overlapping candidate images (referred to as train images in OpenCV terminolgy) to the camera space of the match (or truth) image (referred to as the query image in OpenCV terminology). This single feature allows users to apply virtually all OpenCV detector and extractor, including algorithms that are not scale and rotation invariant. Other popular image formats are supported using OpenCV imread() image reader API. Images supported here can be provided as the image input files. However, these images will not have geometric functionality so support for the fast geometric option is not available to these images. As a consequence, FBM algorithms that are not scale and rotation invarant are not recommended for these images unless they are relatively spatially consistent. Nor can the point geometries be provided - only line/sample coorelations will be computed in these cases. Note that all images are converted to 8-bit when read in. Detectors, extractors, matchers, and robust matcher parameters are specified by a specification string entered as the ALGORITHM parameter. The basic scheme is shown below (optional portions are surrounded by [ ]). The specification string consists of between two and four components separated by /. Each component consists of entries separated by @. The first component of the specification string, detector[@param1:value1@...], defines the detector. The first entry is the name of the algorithm. The remaining entries are separated by @ and define parameters for the detector. The entries consist of the parameter name followed by : and then the parameter value. After the detector component is / and then the extractor component, extractor[@param1:value@...] After the extractor component is / and then the matcher component, [matcher@param1@value1@...]. The extractor and matcher components are formatted the same way as the detector component. The final component of the specification string, [/parameters@param1:value1@...] defines the robust matcher parameters. The first entry is the word parameters. The remaining entries consist of parameter name:value pairs, just like the parameters in the algorithm components. An alternative scheme for the specification string allows the components to be in any order. Each component is formatted the same, except the first entry in the detector, extractor, and (if specified) matcher components begin with detector., extractor., and matcher. respectively. For example, the specification below would enable root sift in the outlier detection, define a FAST detector, define a LATCH descriptor extractor, and define a FlannBased matcher. Many FBM algorithms are designed to use a specific detector, extractor pair with shared parameters (SIFT and SURF are good examples of this). For these cases, the alternative specification scheme allows for the detector and extractor to be defined in a single component with shared parameters. To do this, begin the first entry with feature2d.. For example, the following specification would define a SIFT algorithm with 4 octave layers for both the detector and extractor along with a brute force matcher using the L1 norm. The minimum specification string consists of a detector name and an extractor name. When no matcher is specified, a brute force matcher with parameters tailored to the extractor is used. For example SURF/SURF would result in SURF being used for the detector, SURF being used for the extractor, and a brute force matcher used for the matcher. If used with the alternatice specification scheme, the detector and extractor can be defined in a single component. So, the specification feature2d.SURF defines the exact same detector, extractor, and matcher as the previous specification. Multiple sets of FBM algorithms and robust matcher parameters can be entered via the ALGOSPECFILE parameter. It takes a text file (*.lis) with a specification on each line. For each specification, a separate set of FBM algorithms and robust matcher parameters will be created. Each set will be used to match the input images and the set that produces the best matches will be used to create the output control network. When the DEBUG and/or DEBUGLOG parameters are used, the results from each set along with the quality of the match will be output. Each algorithm has default parameters that are suited to most uses. The LISTALL parameter will list every supported detector, extractor, and matcher algorithm along with its parameters and default values. The LISTSPEC parameter will output the results of the parsed specification string(s). A description of every algorithm supported by findfeatures and if they can be used as a detector, extractor, and/or matcher can be found in the Algorithms table. Descriptions of the robust matcher parameters and their default values can be found in the Robust Matcher Parameters table. Choosing effective algorithms and parameters is critical to successful use of findfeatures. If a poor choice of algorithms and/or parameters is made, findfeatures will usually complete, but the computation time and/or output control network quality will suffer. findfeatures supports all of the OpenCV 3.1 detectors, extractors, and matchers. Some algorithms work well in a wide range of scenarios (SURF and SIFT are both well tested and very robust), while others are highly specialized. The following section will help you successfully determine which algorithms and parameters to use. findfeatures gives users a wide range of options to adjust how it works. Such broad power can be daunting when the user is unfamiliar with FBM. The following are some rules-of-thumb to help make things a little less daunting. First, when in doubt, trust the defaults. The defaults in findfeatures are designed to be a good fit for a wide range of scenarios. They are not a perfect fit for every situation but a perfect fit usually is not required. The detector and extractor do not default to a specific algorithm, but the SIFT algorithm is a very robust algorithm that will produce a high quality output control network for most situations. The majority of more modern algorithms are focused on speed increases. Second, if possible, always use the FASTGEOM parameter. The majority of problems when using FBM arise from the trainer and query images not having the same geometry. The FASTGEOM parameter completely eliminates these challenges. Combining the FASTGEOM parameter with algorithms that are designed for speed (the FAST descriptor and BRIEF extractor are good options) will quickly produce a high quality control network. Finally, if you are torn between a few options, use the LISTSPEC parameter to test each of them and then only use the best result. When the LISTSPEC parameter is used, findfeatures will automatically determine which specification produced the best matches and use it to create the output control net. Different detectors search for different types of features. For example, the FAST algorithm searches for corners, while blob detection algorithms search for regions that contrast their surroundings. When choosing which detector to use, consider the prominent features in the image set. The FAST algorithm would work well for finding key points on a linear feature, while a blob detection algorithm would work well for finding key points in nadir images of a heavily cratered area. When choosing an extractor there are two things to consider: the invariance of the extractor and the size of the extracted descriptor. Different extractors are invariant to (not affected by) different transformations. For example, the SURF algorithm uses descriptors that are invariant to rotation, while BRIEF feature descriptors are not. In general, invariance to more transformations comes at a cost, bigger descriptors. Detectors often find a very large number of key points in each image. The amount of time it takes to extract and then compare all of the resultant feature descriptors heavily depends upon the size of the descriptor. So, more invariance usually means longer computation times. For example, using the BRIEF extractor (which extracts very small feature descriptors) instead of the SURF extractor (which has moderately sized feature descriptors) provides an order of magnitude speed increases for both extraction and matching. If your images are from the similar sensors and under similar conditions, then an extractor that uses smaller descriptors (BRISK, BRIEF, etc.) will be faster and just as accurate as extractors that use larger, more robust descriptors (SIFT, SURF, etc.). If your images are from very different sensors (a spot spectrometer and a highly distorted framing camera, a low resolution framing camera and a high resolution push broom camera, etc.) or under very different conditions (very oblique and nadir, opposing sun angles, etc.) then using an extractor with a more robust descriptor will take longer but will be significantly more accurate than using an extractor with a smaller descriptor. findfeatures has two options for matchers: brute force matching and a FLANN based matcher. The brute force matcher attempts to match a key point with every key point in another image and then pairs it with the closest match. This ensures a good match but can take a long time for large numbers of images and key points. The FLANN based matcher trains itself to find the approximate best match. It does not ensure the same accuracy as the brute force matcher, but is significantly faster for large numbers of images and key points. By default findfeatures uses a brute force matcher with parameters set based upon the extractor used. Several parameters allow for fine tuning the outlier rejection process. The RATIO parameter determines how distinct matches must be. A ratio close to 0 will force findfeatures to consider only un-ambiguous matches and reject a large number of matches. If many, indistinct features are detected in each image, a low ratio will result in a smaller, higher quality control network. If few, non-distinct features are detected in each image, a high ratio will prevent the control network from being too sparse. The EPITOLERANCE and EPICONFIDENCE parameters control how outliers are found when the fundamental matrices are computed. These parameters will have the highest impact when the query and trainer images are stereo pairs. The HMGTOLERANCE parameter controls how outliers are found after the homography matrices are computed. This parameter will have the highest impact when the query and trainer images have very different exterior orientations. Prior to FBM, findfeatures can apply several transformations to the images. These transformations can help improve match quality in specific scenarios. The FASTGEOM, GEOMTYPE, and FASTGEOMPOINTS parameters allow for reprojection of the trainer images into the query image's geometry prior to FBM. These parameters can be used to achieve the speed increases of algorithms that are not rotation and/or scale invariant (BRIEF, FAST, etc.) without loss of accuracy. These parameters require that the trainer and query images are ISIS cubes with geometry. For rotation and scale invariant algorithms (SIFT, SURF, etc. ), these parameters will have little to no effect. The FILTER parameter allows for the application of filters to the trainer and query images prior to FBM. The SOBEL option will emphasize edges in the images. The Sobel filter can introduce artifacts into some images, so the SCHARR option is available to apply a more accurate filter. These filters allows for improved detection when using an edge based detector (FAST, AGAST, BRISK, etc.). If an edge based detector is not detecting a sufficient number of key points or the key points are not sufficienty distinct, these filters may increase the number of successful matches. The OpenCV methods used in the outlier rejection process have several options that can be set along with the algorithms. The available parameters are listed in the Robust Matcher Parameters table. SaveRenderedImages False Option to save the images that are matched after all transforms (e.g., fast geom, filtered, etc...) have been applied. The query (MATCH) image will have "_query" will be appended to the base name. All FROM/FROMLIST images will have "_train" appended to their names. They are saved as PNG images in the directory specifed by the SavePath parameter. SavePath $PWD Specify the directory path to save all transform rendered images if SaveRenderedImages=TRUE. RootSift False Apply the RootSift algorithm to the descriptors that normalizes SIFT-type of descriptors. A good description of the application of this algorithm is described in this article. In general, SIFT descriptors histograms are compared in Euclidean space. RootSift applies a Hellinger kernel to the descriptor histograms that greatly improve performance and still allows Euclidean distances in its evaluation. Be sure to use this for SIFT-type descriptors only. MinimumFundamentalPoints 8 The Epipolar algorithm in OpenCV requires a minimim of 8 points in order to properly compute the fundamental matrix. This parameter allows the user to specify the minimum number of points allowed. RefineFundamentalMatrix True A single computation of the fundamental matrix is performed unless this parameter is set to true. In this case, a new fundmental matrix is computed after outlier are detected and removed. This will improve the matrix since outliers are removed and the matrix is recomputed. MinimumHomographyPoints 8 As in the Epipolar fundamental matrix, a minimum number of 8 points is required to compute the homography matrix for outlier detection. This parameter allows the user to specify a new minimum. AGAST Detector The AGAST algorithm is a corner detection algorithm that builds on the FAST algorithm to detect features as quickly as possible. The main improvements are increased detection speed and less training time. Blob Detector A simple blob detection algorithm that attempts to identify connected components of the image based on DN values. The Blob algorithm is able to filter features after detection based on their characteristics. FAST Detector The FAST algorithm is a corner detection algorithm that is designed to detect corners extremely quickly. It uses machine learning to improve its accuracy. GFTT Detector The GFTT algorithm is based upon the Harris corner detector. The detection is based upon the idea that a corner varies significantly from all immediately adjacent regions. MSD Detector MSD stands for Maximal Self-Dissimilarities. It is based upon the idea that regions that vary significantly from their surroundings are easy to uniquely identify from different perspectives. The MSD algorithm detects generic features, so it is invariant to many image transformations and works well with stereo pairs. MSER Detector The MSER algorithm searches for regions which have significantly higher or lower intensity compared to their immediate surroundings. It works well for extracting features from images that lack strong edges. Because it depends upon intensity, MSER is very sensitive to factors such as solar angle and occlusion. In exchange MSER offers strong invariance to image geometry factors such, as resolution and emission angle (as long as features are not occluded). Star Detector The Star algorithm is OpenCV's implementation of the CenSurE algorithm which is fast and scale-invariant. It is a more robust version of the SIFT algorithm. AKAZE Detector, Extractor The AKAZE (accelerated KAZE) algorithm is a modified version of the KAZE algorithm which uses a faster method to compute non-linear scales. Like the KAZE algorithm, AKAZE works well for situations where the trainer and query images have different resolutions and possibly different distortions. AKAZE should be used over KAZE when strong invariance is needed but the size and/or number of images presents computation time concerns. The AKAZE algorithm can only be used as an extractor if either the KAZE or AKAZE algorithm was used as the detector. BRISK Detector, Extractor The BRISK algorithm uses concentric rings of points around features to extract a descriptor. It extracts a small, binary descriptor, so it is very fast. Unlike other binary descriptor extractors, BRISK offers moderate rotation invariance by use points far from the feature to determine orientation and then points close to the feature to determine intensity after accounting for the orientation. KAZE Detector, Extractor The KAZE algorithm is a very robust algorithm that attempts to provide improved invariance to scale. The method that SIFT and SURF use to provide scale invariance can result in proliferation of noise. The KAZE algorithm employs a non-linear scaling method that helps prevent this. Hence, the KAZE algorithm provides very strong invariance, but at the cost of large computation time. If very strong invariance is required but computation time is a concern, use the AKAZE algorithm instead. The KAZE algorithm can only be used as an extractor if either the KAZE or AKAZE algorithm was used as the detector. ORB Detector, Extractor The ORB algorithm extracts a very fast binary descriptor. It provides improved rotational invariance compared to BRIEF by accounting for orientation, but at the cost of slower extraction. It also attempts to learn the best way to extract information from around each feature. The ORB algorithm is faster than BRISK and FREAK, but provides less invariance. SIFT Detector, Extractor The SIFT algorithm is one of the oldest and most well tested FMB algorithms. It is a common benchmark for comparison of new algorithms. The SIFT algorithm offers good invariance, but can require large computation times. It is a good choice for both detector and extractor when a high quality output control network is needed and computation time is not a major concern. SURF Detector, Extractor The SURF algorithm was created to be a faster version of SIFT. It provides slightly less invariance, but requires significantly less computation time. The SURF algorithm is a good choice when a high quality match is required and there are a large number of images and/or the image size is very large. BRIEF Extractor The BRIEF algorithm extracts an extremely fast binary descriptor. If the query and trainer images are very similar, then the BRIEF algorithm offers unmatched speed. This speed comes at a cost, the BRIEF algorithm behaves very poorly if the query and trainer images vary significantly. The FASTGEOM parameter can help improve the quality of the match when using the BRIEF algorithm with varied query and trainer images. DAISY Extractor The DAISY algorithm is an adaptation of the extractor used by SIFT and SURF. It was designed for use with stereo imagery. The DAISY algorithm offers strong invariance similar to SIFT and SURF, but with significantly faster computation time. FREAK Extractor The FREAK algorithm extracts a fast binary descriptor. Like ORB, it attempts to learn the best way to extract information from around the features. The FREAK algorithm replicates how the human retina works attempting to produce tiered solutions. If the first solution does not provide uniqueness within a desired threshold, then a second, more precise solution is computed. The FREAK algorithm provides fast computation times along with adaptability to the requirements of the query and trainer images. LATCH Extractor The LATCH algorithm extracts a fast binary descriptor that offers greater invariance than other binary descriptor extractors. It lies between the extremely fast binary descriptor extractors (BRIEF and BRISK) and the very invariant but slow descriptor extractors (SURF and SIFT). The LATCH algorithm also offers a CUDA implementation that allows for extremely fast computation times when using multiple GPUs in parallel. LUCID Extractor The LUCID algorithm was designed to extract feature descriptors from color images. It offers invariance close to SURF and BRIEF with shorter computation times. BFMatcher Matcher The brute force matcher algorithm attempts to match the query and train images by brute force. It is guaranteed to find the best match, because it checks every match. For large numbers of features, this approach can require considerable computation time. FlannBasedMatcher Matcher The FLANN based matcher algorithm computes matches based on approximate nearest descriptors. It uses the FLANN library to learn how to approximate descriptor matches. The FLANN based matcher algorithm does not guarantee the best match for each feature, but will match large sets of features and/or images in significantly less time that the brute force matcher algorithm. When combined with outleir rejection, the FLANN based matcher algorithm can provide high quality matches. An additional feature of findfeatures is a detailed debugging report of processing behavior in real time for all matching and outlier detection algorithms. The data produced by this option is very useful to identify the exact processing step where some matching operations may result in failed matching operations. In turn, this will allow users to alter parameters to address these issues to lead to successful matches that would otherwise not be able to achieve. 37 --> Matching 2 nearest neighbors for ratio tests..
91 %% match-pair complete in 5.589 seconds! In the above example, lines 2-13 provide general information about the program and compute environment. If MAXTHREADS were set to a value less than 4, number of total threads (line 11) would reflect this number. Line 15 specifies the precise time the matcher algorithm was invoked. Line 18-25 shows the algorithm string specification, names of query (MATCH) and train (FROM) images and the full and rendered sizes of images. Lines 27 and 28 show the total number of keypoints or features that were detected by the SURF detector for both the query (11823) and train (11989) images. Lines 31-33 indicate the descriptors of all the feature keypoints are being extracted. Extraction of keypoint descriptors can be costly under some conditions. Users can restrict the number of features detected by using the MAXPOINTS parameter specify the maximum numnber of points to save. The values in brackets in lines 27 and 28 will show the total amount of features detected if MAXPOINTS are used. Outlier detection begins at line 35. The Ratio test is performed first. Here the matcher algorithm is invoked for each match pair, regardless of the number of train (FROMLIST) images provided. For each keypoint in the query image, the two nearest matches in the train image are computed and the results are reported in lines 39-42. Then the bi-directional matches are computed in lines 43-46. A bi-directional ratio test is computed for the query->train matches in lines 47-54 and then train->query in lines 55-62. You can see here that a significant number of matches are removed in this step. Users can adjust this behavior, retaining more points by setting the RATIO parameter closer to 1.0. The symmetry test, ensuring matches from query->train have the same match as train->query, is reported in lines 63-67. In lines 68-74, the homography matrix is computed and outliers are removed where the tolerance exceeds HMGTOLERANCE. Lines 75-83 shows the results of the epipolar fundamental matrix computation and outlier detection. Matching is completed in lines 84-90 which report the final spatial homography computations to produce the final transformation matrix between the query and train images. Line 89 shows the final number of control measures computed between the image pairs. Lines 35-90 are repeated for each query/train image pair (with perhaps slight formatting differences). Line 91 shows the total processing time for the matching process. 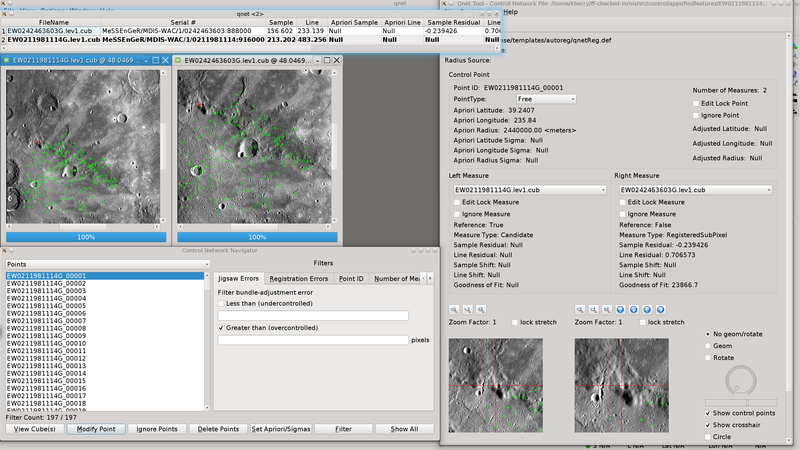 findfeatures provides users with many features and options to create unique algorithms that are suitable for many of the diverse image matching conditions that naturally occur during a spacecraft mission. Some are more suited for certain conditions that others. But how does one determine which algorithm combination performs the best for an image pair? By computing standard performance metrics, one can make a determination as to which algorithm performs best. Using the ALGOSPECFILE parameter, users can specify one or more algorithms to apply to a given image matching process. Each algorithm specified, one per line in the input file, results in a the creation of a unique robust matcher algorithm thatis applied to the input files in succession. The performance of each algorithm is computed for each of the matcher from a standard set of metrics described in a thesis titled Efficient matching of robust features for embedded SLAM. From the metrics described in this paper, a single metric that measures the abilities of the whole matching process is computed that are relevant to all three FBM steps: detection, description and matching. This metric is called Efficiency. The Efficiency metric is computed from two other metrics called Repeatability and Recall. Repeatability represents the ability to detect the same point in the scene under viewpoint and lighting changes and subject to noise. The value of Repeatability is calculated as: Repeatability = |correspondences| / |query keypoints| Here, correspondences are the total number of matches that were made after all FBM processing including outlier detection. Repeatability is only relevant to the feature detector, and nothing about feature descriptor or descriptor matcher. The higher value of Repeatability, the better performance of feature detector. Recall represents the ability to find the correct matches based on the description of detected features, The value of Recall is calculated as: Recall = |correct matches| / |correspondences| Because the detected features are already determined, Recall only shows the performance of the feature descriptor and descriptor matcher. The higher value of Recall, the better performance of descriptor and matcher. Efficiency combines the Repeatability and Recall. It is defined as: Efficiency = Repeatability * Recall = |correct matches| / |query keypoints| Efficiency measures the ability of the whole image matching process, it is relevant to all three steps: detection, description and matching. The higher value of Efficiency , the more accurate the image matching. The three metrics Repeatability, Recall and Efficiency are also called a quality measure. Kris Becker 2015-08-28 Original Version. Kris Becker 2015-09-29 Throws an error when no control points are created if user opts to create a network file. Line/Samp coordinate was transposed when determining the apriori laitude/longitude. Kris Becker 2015-11-13 Apply the RANSAC homography outlier detection before fundamental epipolar outlier detection followed by final refined point transform homography matrix - addresses a false positive issue. Kris Becker 2016-02-10 Updated the ImageSource class for proper use of the Histogram class for conversion to 8-bit. Kris Becker, Jesse Mapel, Kristin Berry, Jeannie Backer 2016-12-27 Updated to use OpenCV3. Backward Compatibility Issue: The LISTMATCHERS parameter was removed; Different feature detection, feature extraction, and matching algorithms are available in OpenCV3 than in version 2, therefore some have been added and some have been removed. References #4556. Kris Becker 2017-01-03 Corrected a bug in creation of the matcher algorithm if not provided by the user; updated some additional elements of the documentation to be consistent with OpenCV3; added additional code to allow for spaces in some areas of the user algorithm string specification; changed the program version to 1.0 from 0.1. References #4556. Jesse Mapel 2017-04-14 Corrected a bug where keypoints and descriptors were being overwritten when using multiple algorithm specificiations. Added a new clone() method to MatchImage and made the MatchImages used by each algorithm specification independent. Fixes #4765. Jesse Mapel 2017-06-22 Modified the Sobel and Scharr filters to create a deep copy of the image before being applied. This corrects repeated applications of a Gaussian filter when using these filters with multiple algorithm specifications. Fixes #4904. Jesse Mapel 2017-06-23 Corrected several errors in documentation. Fixed the MSER algorithm name. Fixed AKAZE being flagged as only an extractor. Fixes #4950. POINTID The pattern to be used to create point ids. DESCRIPTION The description of the network. This cube/image (train) will be translated to register to the MATCH (query) cube/image. This application supports other common image formats such as PNG, TIFF or JPEG. Essentially any image that can be read by OpenCV's imread()routine is supported. All input images are converted to 8-bit when they are read. Each file name in a FROMLIST file should be on a separate line. Name of the image to match to. This will be the reference image in the output control network. It is also referred to as the query image in OpenCV documentation. All input images are converted to 8-bit when they are read. This file will contain the Control Point network results of findfeatures in a binary format. There will be no false or failed matches in the output control network file. Using this control network and TOLIST in the qnet application, the results of findfeatures can be visually assessed. This file will contain the list of (cube) files in the control network. For multi-image matching, some files may not have matches detected. These files will not be written to TOLIST. The MATCH file is always added first and all other images that have matches are added to TOLIST. Using this list and the ONET in the qnet application, the results of findfeatures can be visually assessed. This file will contain the list of (cube) files that were not successfully matched. This can be used to run through individually with more specifically tailored matcher algorithm specifications. NOTE this file is appended to so that continual runs will accumulate failures making it easier to handle failed runs. This parameter provides user control over selecting a wide variety of feature detectors, extractors and matcher combinations. This parameter also provides a mechanism to set any of the valid parameters of the algoritms. To accomodate a potentially large set of feature algorithms, you can provide them in a file. This format is the same as the ALGORITHM format, but each unique algorithm must be specifed on a seperate line. Thoeretically, the number you specify is unlimited. This option is particularly useful to generate a series of algorithms that vary parameters for any of the elements of the feature algorithm. If true, information about the detector, extractor, matcher, and parameters specified in the ALGORITHM or ALGOSPECFILE parameters will be output. If multiple sets of algorithms are specified, then the details for each set will be output. This parameter will retrieve all the registered OpenCV algorithms available that can created by name. When an information option is requested (LISTSPEC), the user can provide the name of an output file here where the information, in the form of a PVL structure, will be written. If any of those options are selected by the user, and a file is not provided in this option, the output is written to the screen or GUI. Description  = "The OpenCV ORB Feature2D detector/extractor algorithm. At times, things go wrong. By setting DEBUG=TRUE, information is printed as elements of the matching algorithm are executed. This option is very helpful to monitor the entire matching and outlier detection processing to determine where adjustments in the parameters can be made to produce better results. Provide a file that will have all the debugging content appended as it is generated in the processing steps. This file can be very useful to determine, for example, where in the matching and or outlier detection most of the matches are being rejected. The output can be lengthy and detailed, but is critical in the determination where adjustments to the parameters can be made to provide better results. This file can contain specialized parameters that will modify certain behaviors in the robust matcher algorithm. They can vary over time and are documented in the application descriptions. Specifies the maximum number of keypoints to save in the detection phase. If a value is not provided for this parameter, there will be no restriction set on the number of keypoints that will be used to match. If specified, then approximately MAXPOINTS keypoints with the highest/best detector response values are retained and passed on to the extractor and matcher algorithms. This parameter is useful for detectors that produce a high number of features. A large number of features will cause the matching phase and outlier detection to become costly and inefficient. For each feature point, we have two candidate matches in the other image. These are the two best ones based on the distance between their descriptors. If this measured distance is very low for the best match, and much larger for the second best match, we can safely accept the first match as a good one since it is unambiguously the best choice. Reciprocally, if the two best matches are relatively close in distance, then there exists a possibility that we make an error if we select one or the other. In this case, we should reject both matches. Here, we perform this test by verifying that the ratio of the distance of the best match over the distance of the second best match is not greater than a given RATIO threshold. Most of the matches will be removed by this test. The farther from 1.0, the more matches will be rejected. The tolerance specifies the maximum distance in pixels that feature may deviate from the Epipolar lines for each matching feature. This parameter indicates the confidence level of the epipolar determination ratio. A value of 1.0 requires that all pixels be valid in the epipolar computation. If we consider the special case where two views of a scene are separated by a pure rotation, then it can be observed that the fourth column of the extrinsic matrix will be made of all 0s (that is, translation is null). As a result, the projective relation in this special case becomes a 3x3 matrix. This matrix is called a homography and it implies that, under special circumstances (here, a pure rotation), the image of a point in one view is related to the image of the same point in another by a linear relation. The parameter is used as a tolerance in the computation of the distance between keypoints using the homography matrix relationship between the MATCH image and each FROM/FROMLIST image. This will throw points out that are (dist > TOLERANCE * min_dist), the smallest distance between points. This parameter allows users to control the number of threads to use for image matching. A default is to use all available threads on system. If MAXTHREADS is specified, the maximum number of CPUs are used if it exceeds the number of CPUs physically available on the system or no more than MAXTHREADS will be used. When TRUE, this option will perform a fast geometric linear transformation that projects each FROM/FROMLIST image to the camera space of the MATCH image. Note this option theoretically is not needed for scale/rotation invariant feature matchers such as SIFT and SURF but there are limitations as to the invariance of these matchers. For matchers that are not scale and rotation invariant, this (or something like it) will be required to orient each images to similar spatial consistency. Users should determine the capabilities of the matchers used. Provide options as to how FASTGEOM projects data in the FROM (train) image to the MATCH (query) image space. CAMERA Fastgeom will project the FROM image into the MATCH space This option projects the image in the same manner as cam2map. The common area of the FROM image is projected into an image of the same size as the MATCH image. This is comparable to cam2map in that it projects the FROM image into the camera space of the MATCH image. Features should be located at the same general line and sample location in both images. CROP Fastgeom will crop the FROM image to common area of MATCH Fastgeom will crop the FROM image to common area of MATCH and retain on the approximate size of the cropped region. This option is useful to limit features to be identified in the common region in both images. MAP Fastgeom will fully map project all of the FROM image Fastgeom will preserve all of the FROM image using the translation computed from common space. This is comparable to map2map in that the whole from is projected using the MATCH geometry. The size of the image is determined by projecting the corners of the FROM image using the MATCH geometry. Images can be quite large or small if there is a large resolution difference. Apply an image filter to both images before matching. These filters are typically used in cases of low emission or incidence angles are present. They are intended to remove albedo and highlight edges and are well-suited for these types of feature detectors. None No filters will be applied The default condition is that no filters will be applied to the images. SOBEL Apply Sobel filtering to both FROM and MATCH images The Sobel filter to both the FROM and MATCH images for enhanced edge detection. The 8-bit images are first scaled to 16-bit and a Gaussian Blur noise reduction filter is applied before the 3x3 Sobel filter is applied. The BORDER_REFLECT option is used for pixel extrapolation at the edges. SCHARR Apply Scharr filtering to both FROM and MATCH images for enhanced edges. A Scharr filtering to both FROM and MATCH images for enhanced edge detection. The 8-bit images are first scaled to 16-bit and a 3x3 Gaussian Blur noise reduction filter is applied before the 3x3 Scharr filter is applied. The BORDER_REFLECT option is used for pixel extrapolation at the edges. The ID or name of this particular control network. This string will be added to the output control network file, and can be used to identify the network. This string will be used to create unique IDs for each control point created by this program. The string must contain a single series of question marks ("?"). For example: "VallesMarineris????" The question marks will be replaced with a number beginning with zero and incremented by one each time a new control point is created. The example above would cause the first control point to have an ID of "VallesMarineris0000", the second ID would be "VallesMarineris0001" and so on. The maximum number of new control points for this example would be 10000 with the final ID being "VallesMarineris9999". Note: Make sure there are enough "? "s for all the control points that might be created during this run. If all the possible point IDs are exhausted the program will exit with an error, and will not produce an output control network file. The number of control points created depends on the size and quantity of image overlaps and the density of control points as defined by the DEFFILE parameter. This parameter can be used to specify the starting POINTID index number to assist in the creation of unique control point identifiers. Users must determine the highest used index and use the next number in the sequence to provide unique point ids. A text description of the contents of the output control network. The text can contain anything the user wants. For example it could be used to describe the area of interest the control network is being made for. There are two types of control network files that can be created in this application: IMAGE and GROUND. For IMAGE types, the pair is assumed to be overlapping pairs where control measures for both images are created. For NETTYPE=GROUND, only the FROM file measure is recorded for purposes of dead reckoning of the image using jigsaw. IMAGE Create control network using both images Create a control network of image pairs that have been measured for both to be controlled. GROUND Only create a ground network file for dead reckoning Create a control network with only the FROM image so that only its pointing will be updated. For input files that provide geometry, specify which one provides the latitude/longitude values for each control point. NONE is an acceptable option for which there is no geometry available. Otherwise, the user must choose FROM or MATCH as the cube file that wil provide geometry. FROM Use the FROM file to compute geometries for control points Selection of the FROM option indicates use of the FROM file to compute the latitude and longitude of each control point. Note this option cannot be used when there are more than one FROM (via FROMLIST) is given. Must use MATCH for these cases. MATCH Use the MATCH file to compute geometries for control points Selection of the MATCH option indicates use of the MATCH file to compute the latitude and longitude of each control point. This parameter is optional and not neccessary if using Level 1 ISIS cube files. It specifies the name of the target body that the input images are acquired of. If the input images are ISIS images, this value is retrieved from the camera model or map projection. Description  = "The OpenCV SURF Feature2D detector/extractor algorithm. This provides a reference for all the current algorithms and their default parameters. This list may not include all the available OpenCV algorithms nor may all algorithms be applicable. Users should rerun this command to get the current options available on your system as they may differ. Description  = "The OpenCV AGAST Feature2D detector/extractor algorithm. Description  = "The OpenCV AKAZE Feature2D detector/extractor algorithm. Description  = "The OpenCV BRISK Feature2D detector/extractor algorithm. Description  = "The OpenCV FAST Feature2D detector/extractor algorithm. Description  = "The OpenCV GFTT Feature2D detector/extractor algorithm. Description  = "The OpenCV KAZE Feature2D detector/extractor algorithm. Description  = "The OpenCV MSER Feature2D detector/extractor algorithm. Description  = "The OpenCV SIFT Feature2D detector/extractor algorithm. Description  = "The OpenCV Star Feature2D detector/extractor algorithm. Description  = "The OpenCV DAISY Feature2D detector/extractor algorithm. Description  = "The OpenCV FREAK Feature2D detector/extractor algorithm. Description  = "The OpenCV LATCH Feature2D detector/extractor algorithm. Description  = "The OpenCV LUCID Feature2D detector/extractor algorithm. Description  = "The OpenCV BFMatcher DescriptorMatcher matcher algorithm.